Artist Cruise Free. How You May be Able Too. I was amazed at how much art was sold on each of the free cruises my wife and I went on. It got me to thinking, could it be that like speakers, artist cruise free? This is an idea that has not been tried by me, yet is one that may help you think outside the box. It would not be for everyone because of the constraints. It might be possible to propose to to a cruise ship that you would paint during the cruise. This would be an enriching experience and enriching on many levels. This will require more than most artist can do. It may not be for you. You will need to be self contained. It will have to fold up and go into your cabin. Your work area and yourself need to be very neat and clean. You will have to be able to complete at least three or four pieces during your voyage. You will have to enjoy people wanting to talk about being an artist. You will have to have realistic prices. As an example, one artist who was not allowed into an Artistic Mastermind Group I belong to was juried out because she was unrealistic in her pricing. She had a piece she wanted $40,000 for. It was oil on canvas, the frame was warped and she had not ever sold works of any significance prior to this. Most importantly, it was not anywhere near the quality of works that sold for $20,00 in local galleries and they were framed. Considering it further, in my case, even though my one commission has sold for over 50K, I cannot expect to now start charging top price for my acrylic paintings, photography or sculpture until I pay my dues. You have to be able to thrive on rejection. It will be common to have guests come up and say that their nephew does work as good as yours. Or worse. You will have to be able to say thank you and smile. Once I had a man telling me what the inspiration of the piece hanging in a gallery was. When I suggested something different he became quite indignant and made an expression indicating that I was ignorant of the mind of the great artist who created the work before us. It was probably best that he never knew that it was the artist of the piece he was disagreeing with. You should be prepared to sell your art during the cruise. The people who watch you make it will want to buy it. Here is the best part. The cruise ship will handle all of this for you. Your finished pieces will be in the gift shop and they will handle the sales. You should be able to provide boxes for unusual and or fragile pieces. 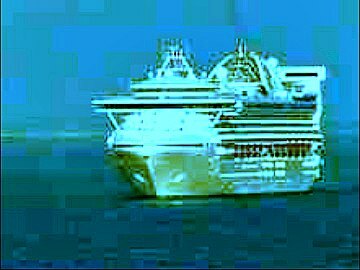 The cruise ship will charge a 30% commission. If you have ever sold in galleries you know this is a bargain. Many artists are paying 40, 45 and even as high as 60% if you want to be represented in New York City. Of course you work will fetch much higher prices in New York but this makes the cruise ship look very reasonable. There are a lot of other requirements to be considered here. There may already be art auctions on board and this cannot compete with the existing relationship. Also, the actual art will have to be approved. This is not something for beginners. You should have been on the show circuit for at least two seasons before you attempt this. The art you produce needs to be family friendly. To meet the challenge will require numerous out of the 16 corner thinking. One artist uses the blue foam insulation inside his stretchers to prevent damage to the canvas. That is just one of many solutions you will need to come up with. There are numerous tricks that can be employed. As an added bonus, consider creating a DVD of you painting with a 15 minute gallery talk. Explain who you are, your inspirations, goals, longings and desires. Tell what keeps you going. Get someone handy with a camera to film it and reproduce it on a DVD. Then you can offer it for $10 or more, depending on the market value. Again, this will have to be approved and will be sold through the gift shop. I have not tried this yet. It is just in the conceptual stages. It is a bit difficult for me since when we cruise we have to fly to Florida or Los Angeles. The airlines are not equipped to carry several 3 x 4 canvas for painting. But if you live within driving distance to a port where Cruise Ships come, you might have a unique opportunity. It will be a way of paying your dues, getting exposure, and selling art all in the short time span of the cruise. Most importantly, it will expose you to thousands of collectors. Who knows, maybe you will be the first to see if its possible that artist cruise free. Which are the five best cruise ships to work for if you want to try the artist cruise free concept? That will be in the next report. I have teamed up with a fellow nurse who also has cruised for free. As a matter of fact, he is the king of free cruising. First, take the time to digest this. However you fare, may you fare well.